Seattle Seahawks quarterback Russell Wilson, above, loses the ball as he is hit by Denver Broncos linebacker Von Miller (58) during the first half of a game Sunday in Denver. The Seahawks recovered the ball on the play. Denver Broncos linebacker Von Miller (58) celebrates with teammates after grabbing a turnover during the second half against the Seahawks on Sunday in Denver. 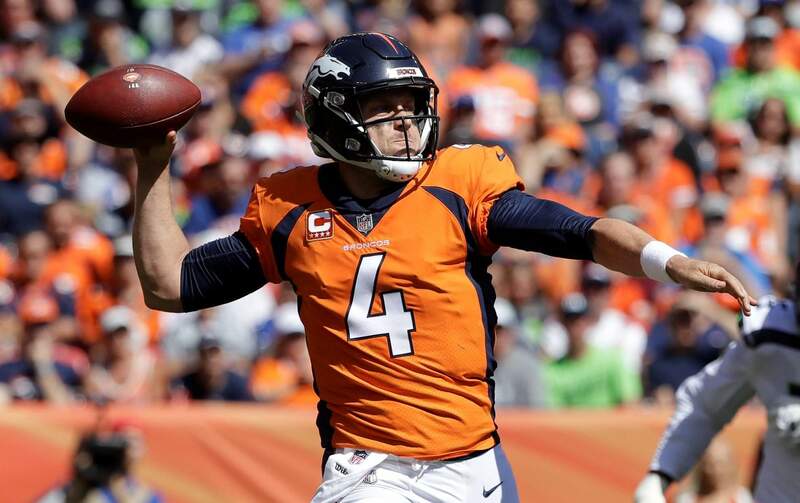 Denver Broncos quarterback Case Keenum throws a pass during the first half of a game against the Seattle Seahawks on Sunday in Denver. Denver Broncos wide receiver Demaryius Thomas reacts after hauling in a touchdown pass in the end zone during the second half against the Seattle Seahawks on Sunday in Denver. 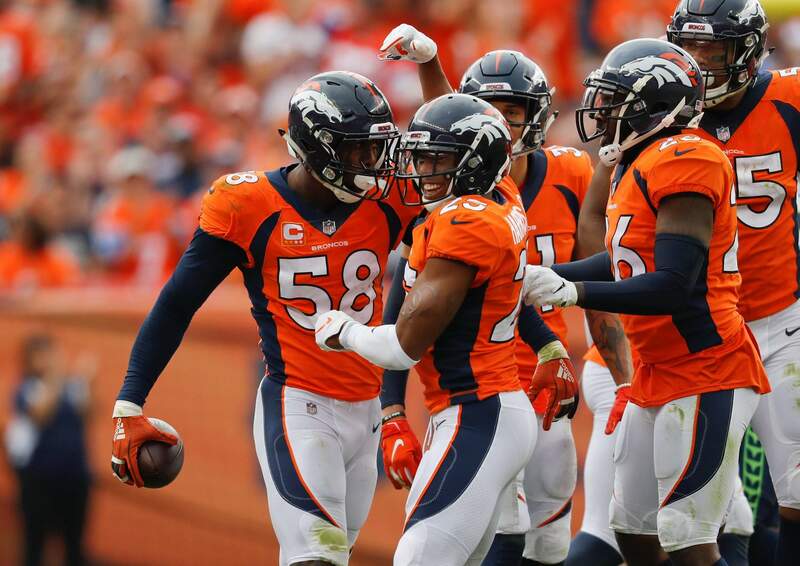 DENVER – Von Miller sacked Russell Wilson three times, forced two fumbles and recovered one in helping Case Keenum win his Denver debut Sunday when the Broncos held off the Seattle Seahawks 27-24. “I still don’t like playing against Russell, I mean, running around out there 20 yards, getting everybody tired,” Miller said after Denver’s 18th win its past 19 home openers. “Luckily, we were able to get him before he could get started. Keenum threw for 329 yards and three touchdowns but was also intercepted three times. Demaryius Thomas atoned for early hiccups with several key catches and a touchdown and Royce Freeman, the first rookie to start an opener for Denver since Hall of Famer Terrell Davis in 1995, helped the Broncos all but salt it away. The Seahawks got the ball back at their 12 with no timeouts and 1:01 left and couldn’t go anywhere, Wilson finally throwing the ball up at midfield where cornerback Adam Jones picked it off with no time remaining. Wilson put the Seahawks ahead 24-20 when he found Tyler Lockett all alone for a 51-yard touchdown catch early in the fourth quarter. But Keenum responded with a 4-yard strike to a tip-toeing Thomas, putting the Broncos back on top for good with 11:11 left. Miller’s best play was one where he simply snatched the ball out of running back Chris Carson’s arms. But on the next play, Keenum threw his third interception, the second one picked off by safety Bradley McDougald, who returned this one 39 yards to the Denver 41. That led to Brandon Marshall’s 20-yard TD catch that tied it at 17 and came against the team he started his career with back in 2006. 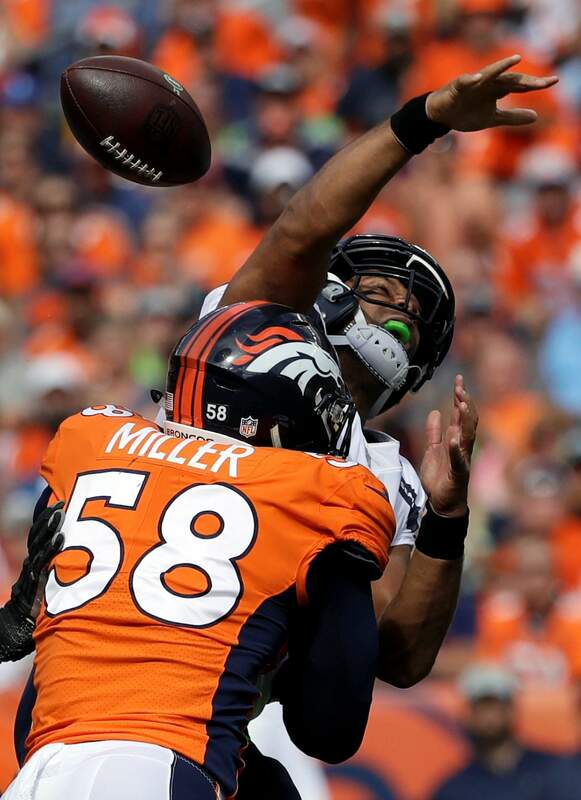 Miller cracked the top 50 on the all-time sacks list with a 13-yard sack of Wilson in the fourth quarter. 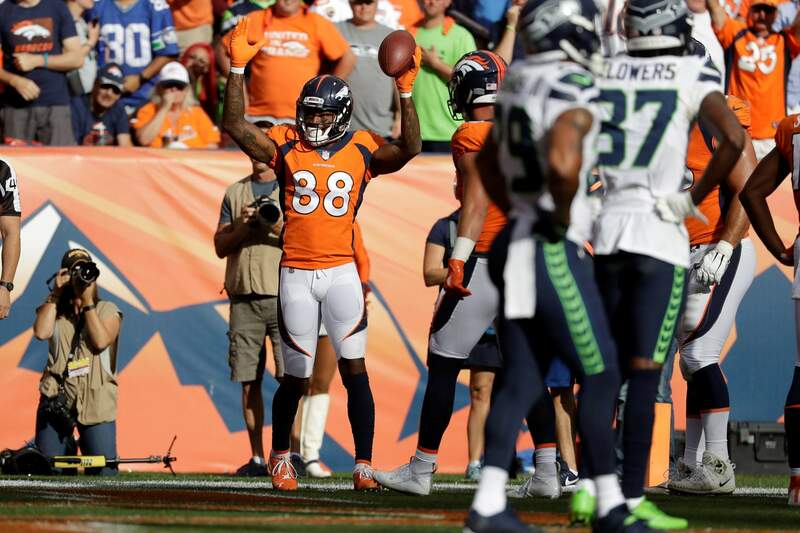 One of Keenum’s interceptions came when Demaryius Thomas, who also had three passes go off his hands and was whistled for a holding call that negated a first-down run, never looked back and safety Earl Thomas snared it in his first game since ending his holdout Wednesday. Six seconds later, rookie tight end Will Dissly blew past rookie linebacker Bradley Chubb and hauled in the 15-yard TD pass. After undrafted rookie Phillip Lindsay turned a short pass from Keenum into a 29-yard touchdown, Dissly again beat Chubb, this time for a 66-yard gain that set up Sebastian Janikowski’s 35-yard field goal. Denver took a 14-10 lead when Emmanuel Sanders somersaulted into the end zone with a 43-yard score. Brandon McManus was good from 51 yards and Janikowski missed back-to-back field-goal attempts from 51 and 46 yards just after the two-minute warning. INJURIES The only injury of note from either team was Seattle WR Doug Baldwin (right MCL sprain). UP NEXTSeattle will visit the Los Angeles Chargers on Sunday. Denver will host the Oakland Raiders on Sunday.